My LYS Sticks & Cups and I are organizing a Knit-A-Long for my latest shawl design Kurkuma. It’s very spicy and so much fun, so join the Kurkuma KAL! We cast on Thursday 11 April during the Cast-On Party at the Sticks & Cups store in Utrecht. Also, I’ll be there with a bunch of my designs, so if you want to take a closer look at some of my shawls and try them on, this is your chance! Can’t make it to the party? No worries! Get your kit before the 11th and post a picture using the #kurkumakal #stickscups and #lavischdesigns hashtags! The pattern is available through this website, but if you can also get it at the shop in a kit. Visit Sticks & Cups on Instagram or Facebook to see some of the yarn combinations Lili has prepared. The first drawing is for all who join by getting a kit at Sticks & Cups: You get a number when you buy your kit at the shop with which you are entered in the prize drawing. Prizes consist of yarn and your pick of a La Visch Designs pattern of choice. The second drawing is for all who love to join the KAL but don’t have the option to visit Sticks & Cups for a kit. On May the 18th I will select my 3 favorite pictures tagged with #kurkumakal & #lavischdesigns. Each of the 3 winners may select a La Visch Designs pattern of choice that will be gifted to you. Both (pictures of) WIP’s and FO’s count, so share pretty pictures on Instagram and Facebook as often as you like! During the KAL I will repost some of the pictures that catch my eye. Make sure to follow La Visch Designs on Instagram or Facebook for all the latest news about the Knit-A-Long. Also, visit the Kurkuma KAL event on Facebook for more info on the KAL. The KAL runs from 11 April to 18 May 2019. Get your Kurkuma kit at Sticks & Cups or just the pattern here. The prize drawing is on 18 May. 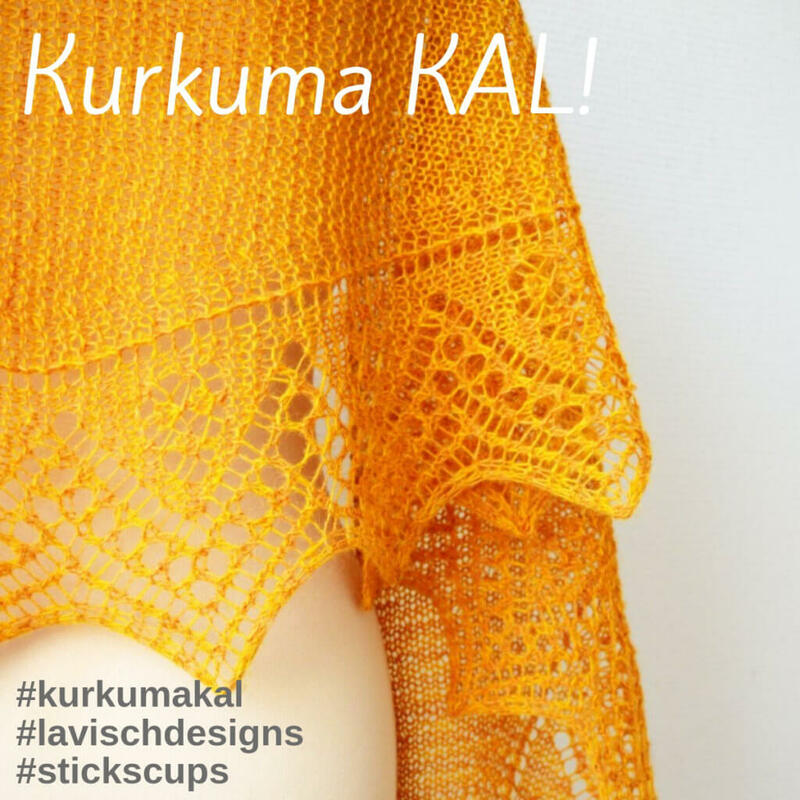 Post lots of pictures using the hashtags #kurkumakal #lavischdesigns and #stickscups. So go get your pattern and yarn and be ready to cast on with us on Thursday. I’m looking forward to seeing your WIP’s and FO’s!